Mynard, J. (2012). Editorial. Studies in Self-Access Learning Journal, 3(3), 212-214. 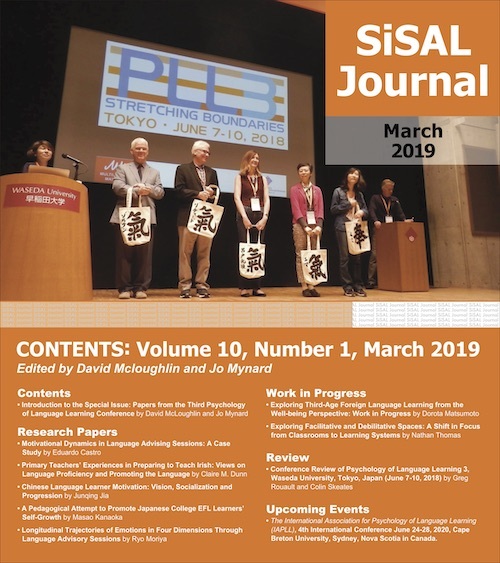 Welcome to the second general issue of SiSAL Journal. Once again, through the publication of a general issue we are able to include some interesting articles that might not necessarily have been received for publication in a special issue. Issues of SiSAL Journal have a good international representation and this current issue is no exception. Contributions come from Mexico, Hong Kong, Japan and Iran. Although this is a general issue of SiSAL Journal, I have identified some salient themes coming through in the articles. These are: training for autonomous learning; scaffolding self-access use; and beliefs about learning and using the L2. Two articles report on studies which investigated the effectiveness of training for autonomous learning. The first article is by Martha Armida Fabela-Cárdenas who reports on a study using Q Methodology which investigated whether a teacher training programme in Mexico had an impact on teachers’ opinions and beliefs about learner autonomy. The results suggest that the training was successful in influencing changes in attitudes. Nahid Yarahmadzehi and Elham Bazleh discuss learner autonomy in the Iranian context. Using a quasi-experimental research design, the authors investigate whether using the Bett’s Autonomous Learner Model leads to any significant improvement in (1) students’ readiness for self-directed learning and (2) students’ language proficiency. The results indicate that “attempts to incorporate autonomous learning into school curriculum would be beneficial”. Two of the article specifically focus on ways in which learners are supported in self-access learning. Robert Croker and Umida Ashurova take a look at ways to introduce first year university students to self-access centres in Japan. The authors discuss the scaffolding activities that were used in order to help “classroom English learners” transform into “SALC English users”. Hazel L. W. Chiu looks at ways to support the development of reading and writing in a self-access centre in Hong Kong. The examples in the author’s paper show how learners’ needs are addressed through individual and small group consultations and how the advisor encourages a deeper-level of engagement with the learning process through the dialogue. Two papers in this issue focus on investigating learners’ beliefs. In her paper, Razieyeh Ahmadi investigates learners’ perceptions and behaviours related to autonomous self-access language learning in Iran. The results of a quantitative study suggest that learners are ready to take charge of some aspects of their self-directed learning, but will need support in other areas. Rob Hirschel, Craig Yamamoto and Peter Lee report on a mixed methods study which investigated Japanese university students’ beliefs about their interest, enjoyment, and confidence with using English. Participants in the study were asked to create and view video recordings of themselves interacting in English and complete self-assessment questionnaires. The results of the study indicate that participants in the video treatment group “were able to perceive gains in interest, enjoyment, and confidence that the control group participants did not”. Jo Mynard is an Associate Professor at Kanda University of International Studies. She is the Director of the Self-Access Learning Centre, Assistant Director of the English Language Institute, and Deputy Director of the Research Institute of Language Studies and Language Education. She holds an Ed.D. in TEFL from the University of Exeter, UK and an M.Phil. in applied linguistics from Trinity College, Dublin. She has taught EFL in Ireland, Spain, England, the UAE and Japan, and has been involved in facilitating self-access learning since 1996. She co-edited three recently published volumes; one on learner autonomy and two on advising in language learning. Many thanks to the contributors for submitting their work to SiSAL Journal, to the reviewers for their feedback and to the editorial team once again for their input, support and editing skills.